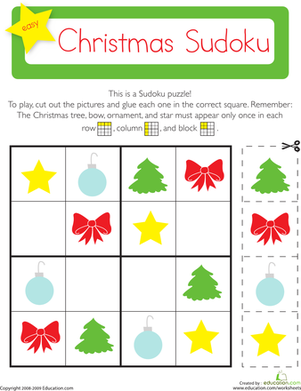 Add to the fun of beginning a new year with this picture Sudoku puzzle, perfect for quiet time indoors. Find where each picture goes in a row or column to finish the puzzle! As one year comes to an end, another year will begin! Celebrate this New Year's Eve with your little ones, and add some festive confetti colors to this picture. 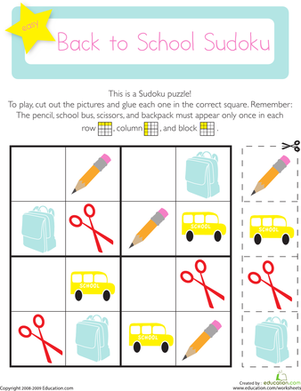 On this year one maths worksheet, kids use their logical reasoning and critical thinking skills to solve a picture Sudoku puzzle with a back to school theme. Engage your child in a fun and festive New Year arts and crafts project. Have them create a paper banner that will surely help bring the new year in with style! This festive coloring page features confetti, balloons, and the message "Happy New Year." New Year's Eve hats let you wear your celebratory spirit on your head. 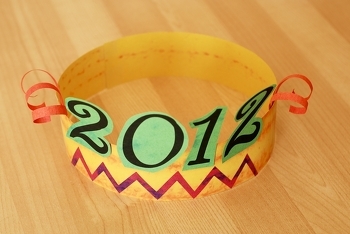 Make New Year's Eve hats with year child to ring in the New Year in style. 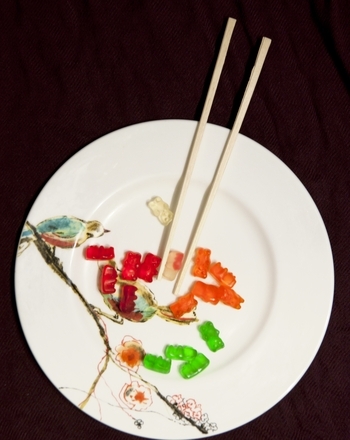 Read about a few traditional Chinese New Year dishes, then use your counting skills to make your own banquet. The Lunar New Year is celebrated in Asian countries and around the world. Teach your little one about this special holiday with a printable mini-book. 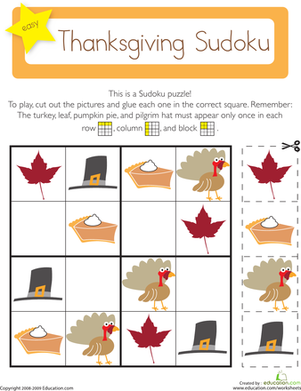 Solve this Thanksgiving Sudoku puzzle by cutting and gluing pictures into the puzzle, with each picture appearing only once in each row, column, and block.